A firearm bill of sale is documentation sellers of firearms use to physically record the selling of their product(s) to a customer. What is a firearm bill of sale? A Firearm Bill of Sale is documentation sellers of firearms use to physically record the selling of their product(s) to a customer. Alternatively, the firearm bill of sale also acts as a receipt for the buyer of the firearm. This document generally includes seller information, details about the goods, location of the sale, price, buyer details and method of payment. 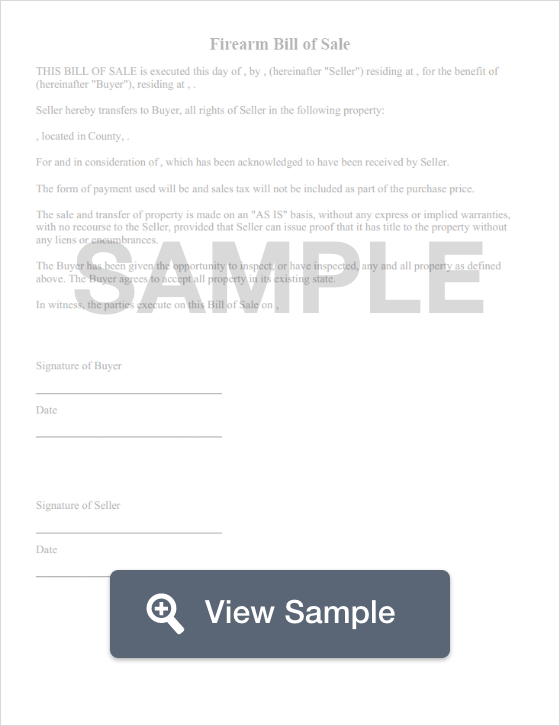 Both buyer and seller should sign the Bill of Sale form and each keep a copy as proof of purchase or proof of payment. This happens upon full payment being made, at which time the firearm changes ownership from seller to buyer. This document explicitly disclaims any pre-existing warranties relating to the quality of the firearm. In this sense, the bill of sale differs from a Sales Agreement, which is a contract containing more specific terms and warranties. The 'sold as-is' clause is an important element of a Bill of Sale document. The phrase refers to the firearm being sold in its current condition and implies that the buyer accepts the firearm as it is, including any potential or apparent faults. This caveat protects the seller from any subsequent request for a refund from the buyer because of any issues arising after receiving and paying for the firearm. For instance, subsequent transportation undertaken by the buyer to take it to its eventual moorings may result in damage, which the seller is not responsibility for. What is a firearm bill of sale used for? Alternative bills of sale can be created for other products. 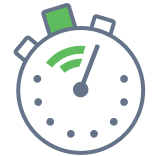 Create a free Firearm Bill of Sale in minutes with our professional document builder. Why should you use a firearm bill of sale? A Bill of Sale protects both the seller and the buyer of the firearm in the case of any future issues, e.g. the firearm having been stolen prior to the current sale. Given many transactions being via cash, proof that the item was paid for in good faith with proper documentation protects a buyer of stolen goods. The buyer has proof of payment in full, should any query be raised later. Similarly, for tax purposes, retention of documentation offers a paper trail for both buyer and seller that can be audited. As a sales document with an 'as-is' clause, the seller is protected against problems reported later by the buyer. The sale date shows when responsibility for the firearm was transferred from seller to buyer. For insurance purposes, you will need to provide documentary proof of legal ownership. A correctly completed bill of sale can become proof of ownership of the firearm. Who should use a gun bill of sale? The Federal Firearms License (FFL) is given to gun shops and businesses to allow them to sell, manufacture, and transport firearms and ammunition. A business with a FFL must follow special procedures, such as conducting background checks to allow customers to purchase firearms. Typically, gun owners do not need a FFL to sell a gun privately unless it is required by their state or local laws. A FFL is required to sell any firearms across state lines. To apply for a FFL, you must complete an application, pay an application fee, and send the completed application to the Bureau of Alcohol, Tobacco, Firearms and Explosives (ATF). The ATF is a law enforcement agency that is part of the United States Department of Justice. Research both the federal law and the gun laws in your state. Make sure you have the necessary permits so that you do not unknowingly break any laws by doing something like engaging in private sales. Sell to a trustworthy person. It’s best to sell to someone that you know, but if that isn’t possible, ask potential buyers to provide proof of identity (driver license). If necessary, perform a background check to make sure the person has a clean criminal record. Negotiate the terms. Make sure that you agree on the purchase price, form of payment, and number of installments. Write a bill of sale. Follow instructions to create a bill of sale that details the transaction. All buyers should sign a disclaimer that verifies he/she is able to purchase the firearm. Meet the buyer. After the bill of sale has been signed, you should meet in person and complete the sale. Ensure that the serial number is on the gun. Guns sold without a serial number may be considered illegal. Is a license needed if providing firearm services such as repair, engraving, or customizing? Yes. Any person carrying out business services is defined as a gunsmith dealer. Who has to conduct a NICS background check prior to transferring ownership of a firearm? Licensed businesses who deal with firearms are legally obliged to conduct a NICS background check prior to transferring ownership of any firearm to a non-licensed person, or when lending for use off-premises. This includes: importers, manufacturers and commercial dealers. What if a firearm is lost or stolen in transit? Should the sender of the firearm report this if the recipient has already filed a report with the ATF? Yes. Only the sender knows all of the detail of how and when the particular firearms were shipped. Also, disposition documentation of the sender needs to be reflect the subsequent theft or loss. A Firearm Bill of Sale documents the selling of firearm(s) 'as is' to a customer by a seller. It acts as a receipt which includes seller information, details about the goods, location of the sale, price, buyer details and method of payment. This document explicitly disclaims any pre-existing warranties relating to the quality of the firearm i.e. sold in its current condition. An invoice is a digital or paper document that evidences any given financial transaction in return for goods or services provided. It details the goods or services sold, associated fees, the date of the transaction, contact details of the seller and method of payment. A contract for deed is used when land is sold from one person to another person if the seller is going to provide financing to the buyer. This legal document is often referred to as a land contract. A Receipt Template is a flexible document that can be branded to a business and have their required information itemised at the point of sale printed and given to the customer.